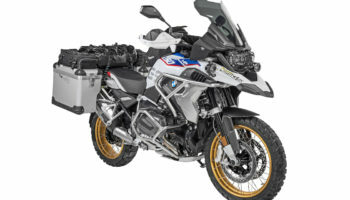 This is part 2 of 3 and focuses on the electronics package in the BMW F750GS/F850GS. The new offerings from BMW have the motorcycle world abuzz. At Touratech, we can’t wait. We’ve broken down the information provided by BMW Motorrad and done a preview of the F750GS and F850GS. Iain here with Touratech USA. We’re breaking down the BMW press release for the new F850GS and F750GS. You want to learn more about the products we have available for these bikes, check out Touratech-usa.com. Now into the electronics package on these new bikes. Again, one of the biggest changes that most people are going to notice while they’re riding is that these bikes have gone to a fly-by-wire throttle system. What that means is, as you turn the throttle grip, the computer knows how much throttle you’re asking for and, depending on what ride mode the bike’s set in or what the traction control status is or anything like that, it’s going to decide how much power it gives you. Now, that’s actually really cool on a bike like a BMW that executes a system like this well because it works seamlessly, and it just makes the motorcycle more functional in a really broad range of conditions. The other cool thing about fly-by-wire is that you get to use all these different ride modes. Those of you who are familiar with the water-cooled 1200GS, since 2013, you’ve had this GS that has all these different ride modes. The 850 and 750 are now going to have the same kind of ride modes available. As standard, they’re going to have a road mode and a rain mode. These riding modes change what the throttle turn does. It changes what the traction control does. It changes what the ABS does, and it changes what the dynamic suspension does depending on if you have that option selected. Available options for these ride modes, if you get extra packages on the bike, you get dynamic, enduro, and enduro-pro. Those are additional ride modes that change the way the traction control and all that stuff works. The most important one for most GS guys to know about is enduro-pro mode, and that’s actually calibrated for use with knobby tires riding off road on unpaved surfaces. What that does is it gives you an aggressive throttle turn. It turns the traction control way down so it allows the back tire to turn quite a bit more than the front tire is turning. That allows you to slide the motorcycle. It also turns the ABS off on the back wheel so you have antilock braking on your front wheel but not on your rear wheel, so you can still lock the back tire up and stop effectively and use it to turn the motorcycle off road. That’s really cool on the water-cooled 1200GSs, and it’s really cool to be able to see that coming onto the F850 and F750GS. Just to be clear, the enduro-pro option is not available on the F750GS. That only comes on the 850. The next thing about ride-by-wire throttle is it allows you to have cruise control. That’s an available option from BMW. Cruise control on an adventure bike is super good. If you’ve never ridden an adventure bike with it, it’s great. Anytime you get up on the freeway, just turn the cruise control on like you would in a car. If you’re going up or down hills, doesn’t matter, holds the speed. Very neat. The other thing that’s cool, an F800 has never had this before, is the gear shift assistant pro. That is a system that allows you to do clutchless up shifts and downshifts while you’re riding the motorcycle. In the past, these systems have really only been well suited to up shifts at full throttle, and that’s because, on a bike that didn’t have fly-by-wire, the only thing you could really do with an assistant like that was just cut your ignition for a second so the RPMs dropped, and you could click into the next gear. With ride-by-wire throttle, they can make super smooth up shifts and downshifts not at wide-open throttle. You can do it even at partial throttle. Even in the press release, BMW calls it out and says if you’re riding two up, it actually makes the ride much smoother for the passenger because the shifts happen much more quickly, and the revs are matched perfectly every time. That’s really cool. That’s something I’m actually interested to try out. I’m curious to see how it works on a chain-drive bike and on a middle-weight bike like an F800. They have added an optional LED headlight on the F850 and F750GSs. That’s not really that special. I just think it looks really cool in the photos, so if I was getting one of those bikes, I would definitely get the LED headlight. The dash is all new. It looks a lot like the dash that you can get on the 2018 R1200GS. It’s a six-and-a-half-inch TFT full-color screen. It’s super bright. You can see it in all sorts of daylight and, on these new models, they have an optional connectivity package that you can get for it, which links up with your smartphone, and you can control Bluetooth playback. If you have a headset on your helmet that’s connected to the dashboard, you can listen to music, you can get phone calls, you can do all that. Also, there’s an app called Revver and BMW and Revver have worked together and you can now get navigation prompts on the screen with a simple arrow that just tells you where to turn. And that’s super cool for following off road tracks. It’s something I recommend everybody looks at, it’s a really well designed system, and it’s going to come on these new bikes, which is really neat. The multi controller, if any of you are familiar with the RT or the 1200GS, on the left hand handlebar, also the BMW has it on the 1600GT and some of their other big touring bikes. But they have what’s called a multi controller which is like a twist and click wheel on the left hand side. That’s how you’re going to manage most of the functions on that big dashboard display. So, that’s a really cool way to navigate that whole system, you don’t have to take your hand off the bar to hit buttons. I’m curious to see how they’ve implemented that. BMW usually does a really good job, so it will probably be very cool. A new thing that they are releasing on this 850, 750 as well as the 1250GS, is called intelligent emergency call function. And, this is a really interesting system, I’m not totally sure how I feel about it yet, but I’m curious to see how it works. What it does is, you have your phone connected to the motorcycle, via Bluetooth. Because, you know, phone calls, navigation, whatever. The motorcycle has a little microphone and a little speaker on it in the dashboard. And it has all sorts of accelerometers that are used for the ride modes, but it’s also paying attention, and it senses if you get into an accident. And, it’s looking for, according to the press release, it’s looking for three different levels of accident, one of them, I assume they’re just using G-force sensors and accelerometers, but if you get in a super bad accident, the motorcycle knows that it’s wrecked, it immediately calls emergency services through your cell phone’s data plan, and it connects to BMWs call center. And, they say in the press release, that you can use any language to speak to them. They have translators, they have people who speak all sorts of different languages, and it’s going to immediately make a call for emergency help, it knows the location of the motorcycle, and it’s going to get aid on its way as soon as possible. Also, at that same time, the loudspeaker on the bike, is going to be trying to yell at you, and say, “Hey, are you alright? What’s the situation?” Try to get more information to give to the aid response. And that’s super cool. No doubt about it, that’s going to save lives. The second option, or the second level of intervention I should say, is it looks for a moderate accident. I don’t know what their limitations are there, maybe it’s as simple as you drop the bike, and if it feels that the bike falls over upside down, it starts a count down essentially, where it’s going to call for emergency help. You have the ability to flip open this little button on the handlebar, and press the button to cancel the call, if you don’t need help. But, if you don’t get to the button, it’s going to call aid. And again, it’s gonna call people in, it knows your location, somebody’s going to be trying to talk to you through the loudspeaker on the bike, and assess the situation. The last level is, manually triggered. So, that’s using the button on the handlebar. You press the button, they call you on the loudspeaker, what’s the situation? Need some help? Maybe not. It’s a really cool system. I’m curious to see how it works out in the real world, but it sounds like, a lot like All star on a GM car, where you’re always connected to some type of aid, which has absolutely saved lives already. It’s very cool to see it on a motorcycle. Next step down, keyless ride, a lot of you guys are really familiar with that, a lot of cars nowadays have push button start. A lot of BMW motorcycles, Harley Davidsons, KTMs, have keyless entry systems where, you get onto the motorcycle, it has a button that you push to unlock the steering, you push the button again, start the bike right away. It’s pretty cool. Dynamic ESA, so dynamic electronic suspension adjustment. The F800 had ESA, so non-dynamic electronic suspension adjustment, the F850GS and the F750GS are also now available with dynamic ESA as an option. That system, according to the press release, has a travel sensor that’s built into the rear shock. And so, the bike knows how quickly the suspension is compressing, or what level the suspension’s riding at, and it can adjust the damping and the pre-load on the motorcycle to get the bike riding and sitting the appropriate way. They also mentioned that this bike has a new system that they call ABS pro, and I’m not totally clear on what that is, but it sounds like standard ABS really just gives you one level of braking intervention, it’s either on or off, like you get on any regular BMW motorcycle nowadays. And, it always works at the same level. ABS pro, sounds like it’s a system that can work with the ride modes, and can engage in multiple different levels, and in multiple different ways. So, if you have the thing in dynamic road mode for aggressive street riding, the ABS is gonna pay less attention to rear wheel lift off. If you’re breaking really aggressively on a track, it’s going to let that back wheel lift and lock without totally killing all your breaking force. If you have it in Enduro Pro, it’s going to turn off the ABS to the rear wheel, so you can lock the back brake up in the dirt. So, it’s just a very cool system that uses the electronics on the bike and helps it all work together better for different riding situations. If you want to learn more about this bike, or any of these products, Touratech’s making a full line for these bikes, you can visit our website Touratech-usa.com, to learn more about it.